The First Ever Detailed Explanation of How to Buy Turnkey Real Estate! Buying turnkey rental properties may be one of the easiest methods of investing in real estate, but that doesn’t mean there aren’t still things you need to know about how to do it correctly and smartly! 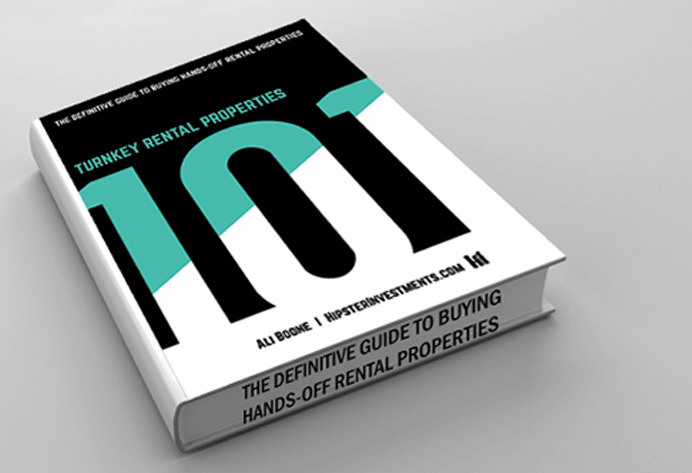 Finally, there is a how-to manual on buying turnkey rental properties, and here it is. Where Will You Find Turnkeys? How Much Do Turnkeys Cost? How Do You Decide Which Market to Buy In? Also included: a special blurb from the Author about why passive income is so important and how investing in real estate can change your life! Buying turnkey real estate is really one of the most straight-forward methods of buying real estate investments. But as mentioned, there is a way to do it correctly and smartly, and these topics cover the information you need to know in order to buy successfully. Even though the process is simple, if you haven’t done it before it can still be confusing since you don’t know what to look for. Don’t worry, now you are covered…via the information in this eBook! Ali Boone began real estate investing in 2011 while working her corporate job as an Aerospace Engineer. Her purchases started with overseas buying in Nicaragua followed by turnkey rental property purchases in Atlanta. Ali always had a knack for engineering the easiest, most simple ways of becoming an investor due to her driving desire to truly have passive income and not have to work for her money. Her main focus has been turnkey rental properties, not just in Atlanta but in several other markets as well. Her primary focus now is helping others to learn more about the turnkey method of buying rental properties, supporting investors through the buying process, and encouraging true lifestyle design via passive income (which is where turnkeys come in handy!). A simple, straight-forward guide on how to buy turnkey rental properties (the smart way!). This guide covers all of the basic knowledge required to buy a turnkey rental property, as well the steps in which to actually buy one. This is not a guide to overnight riches by any means. After reading this eBook, however, you will be prepared to go out and buy a fully-performing turnkey property. Also included is an Additional Resources page which includes several links explaining various concepts not covered in detail in the eBook. These are supplemental topics and not required in order to know how to successfully buy a turnkey, but they are great references that may cover any additional questions or curiosities you come up with during your reading. I enjoyed the book very much, I thought it was a great introduction into turnkey properties and helped ease a lot of my concerns and bust my preconceived notions that steered me away from turnkeys when I started investing last year. I highly recommend the book for anyone interested in learning more about turnkey investing, especially those that still work busy corporate jobs and don't have a lot of free time to take a more active role in acquiring rentals. I'm definitely interested in receiving information on the markets you work in and the properties available in those markets. However, at this time all of my working capital is in play so it's unlikely I'll be active for another couple of months, so I don't know if you'd recommend to wait on subscribing to those mailings. I wouldn't want to get flagged as someone who signed up but isn't taking action, because at this point, once I have available funds again, I intend to purchase a turnkey and see firsthand if it's right for me. I did receive the e-book and absolutely loved it. It was very detailed and transparent about the entire turn-key process, and Ali is clearly experienced in this area and really wants others to succeed as well. As a recent college grad, I'm currently saving 50% of my income every month and hope to buy my first property with Hipsters help sometime next year. I first heard Ali on the Rental Income Podcast with Dan Lane, and immediately headed to your website. After reading a ton of Ali's blog posts and looking back at all of the properties Hipster has posted for sale, I felt confident that purchasing the e-book would be valuable. Feel free to use any part of this email as feedback for the website. I've been researching turnkeys for about 6 months and this book still filled in some gaps. I heard about Hipster through Biggerpockets and it seemed like a good deal so I gave it a shot. Hoping to save cash for another six months and who knows, maybe I'll go with Hipster. I loved the book! Although short, it is very concise and to the point. You can get a lot of "bigger picture" info all over the net, but this book covers a lot of "smaller picture" details that are difficult to find elsewhere. I would highly recommend this book to anyone interested in turnkeys. I recently began working for a REIT, which led me to thinking about how I could get into the world of REI for myself. After many, many books and blogs, my search led me to Hipster Investments. I purchased the “Turnkey Properties 101” e-book and thought that it was really fantastic! Ali does a great job of breaking down all of the benefits of investing in turnkeys as well as the actual processes you need to follow to be successful. Honestly, the most exciting part for me is that for each topic Ali encourages you to ask Hipster any questions you may have. I most definitely recommend the e-book as an introduction into the world of turnkey properties, and am looking forward to taking the next steps with Hipster! I like how the book is a step-by-step with details. I never heard of turnkey promoters before so I enjoyed learning the advantages in working with them. I love the good points Ali makes about purchasing from a turnkey provider in general. I received the eBook and enjoyed it very much. I found it to be a great overview of the turnkey process. It's been hard to sort through some of the conflicting information on turnkeys I've been finding online, but this has helped demystify a lot of it. Very glad I found it. It was a very fast read, very basic straight forward info (isn't that what a 101 should be?). Well written and easy to understand and keeps your attention. I had no clue about promoters and the investor specialist lenders was something I hadn't even thought of. I would have liked to read more first hand experiences everyone learns from others mistakes and success. I was hoping there would be info on finding financing, and ways to get started (but that's prob not fit for a beginners info guide.) I do hope there is a part 2, although the pdf version on my tablet was a little tough to read (super small print) maybe on the laptop it would have been easier. It was really nice to read something so complicated broken down into manageable pieces. I liked how it felt like the author was just talking to me about purchasing a property instead of trying to teach me how to. It really has given me a plan of action. After the last few months of research and education, I've just recently been in the process of strategizing how I'm going to fund this first deal, vetting turn-key companies and building a support team. I'm really inspired and excited to take this step towards a new financial future. I'll certainly be in touch soon to talk more about some ways you might be able to help me make that happen. Thanks! I just read your ebook and I must say that it is awesome Ali!!!! Got it, read it, enjoyed it. I liked the book. It had some good information in it. I got the book and it's a great simple read which works since I'm a beginner. I really enjoyed Ali's ebook. It was a very entertaining and educational read. Very straightforward and practical read on how to go about investing in turnkey rentals. Just read through the book and I loved the detailed explanation of the buying process. I've listened to quite a few podcasts but they don't touch on that step by step process of how to acquire a turnkey property.